The new form of Ahsha arrives. Gastille explains Dumjid lost and returned to Cray, losing one of the Zeroth Dragons to the Good Guys. Gastille explains the Zeroth Dragons are weapons of destruction. The cost of using them is something must be destroyed/lost, be it your opponent or your future potential and dreams. CONT (VC/RC): If your opponent has a Unit at Stand, this Unit cannot attack. Bloom – AUTO (RC) 1/Turn: When another of your Units with the same name as this Unit is placed on (RC), during that turn, this Unit gains Power+2000. AUTO (RC): [Counter Blast 1 & Place this Unit into the Soul] When your Grade 1 or higher Unit with the Bloom ability is placed on the field, you can pay the cost. If you pay it, draw 1 card. 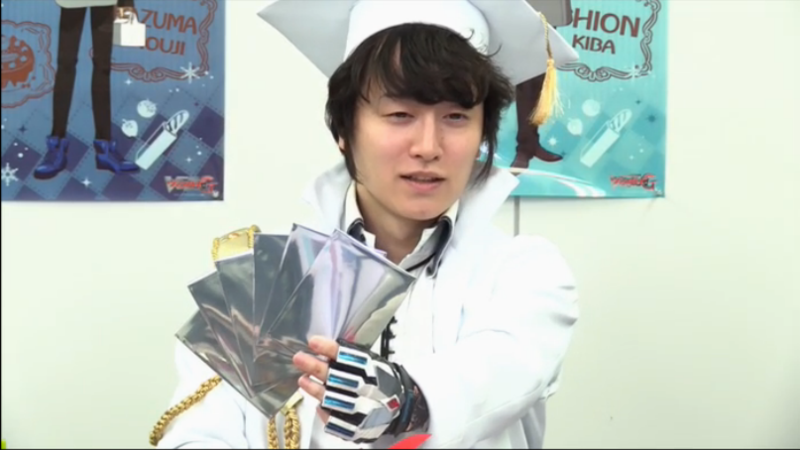 AUTO (VC): [Counter Blast 1 & Choose 1 card from your G Zone, flip it face-up] When this Unit attacks, you can pay the cost. If you pay it, search your Deck for up to 2 Grade 2 or lower Normal Units with the Bloom ability with the same name, Call them to a separate Front Row Circle and Back Row Circle, then shuffle the Deck. AUTO (VC): When your Ride Phase begins, choose up to 1 card each from your non (VC) Circle and your Drop Zone, place them on the bottom of your Deck in any order, and if you place 2, draw 1 card, choose up to 1 card from your hand, Call it to (RC). AUTO (VC): [Counter Blast 1] When your G Unit STRIDEs, you can pay the cost. If you pay it, choose up to 1 Normal Unit with the Bloom Ability from your Deck, Call it to (RC), then shuffle the Deck, and if there are 2 or more of your Units with the same name as that Unit, Counter Charge 1 & Soul Charge 1. Next Week is a Special about The AWAKENING ZOO featuring Aina Aiba (Tokoha’s Voice Actress) as a special guest star.